George Payne has become a staple pregame spot for many students and young people in the area due to its drink specials and theme nights. Gather your friends and challenge others with a party tray (otherwise known as a ‘blackout” tray), or get 5 shots of rum, tequila or Jägermeister for €10. 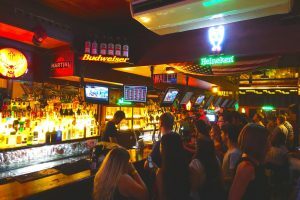 While there are plenty of cheap drinks, they also host a variety of activities and themed nights such as beer pong night on Monday and Karaoke night. If you are looking for a place to take shots, look no further. The bar name literally has “Chupitos” in its title – which is the Spanish word for “shots” — and they definitely live up to their name. They offer 2€ shots and have a wide variety of shots with funny names such as the “Monica Lewinsky” and the “one-night stand” shot. Their bartenders are also known for putting on a performance during their shifts by setting some drinks on fire. 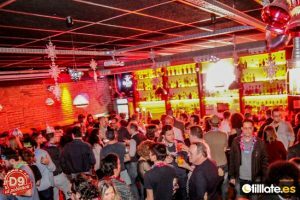 On top of all that, the bar is right next to OttoZutz, one of Barcelona’s hottest night clubs, so the party doesn’t have to end until 6 a.m.
Coco Vail is a great bar for great food and drinks. With 24 craft beers on tap, Coco Vail has one of the largest selections of craft beer in Barcelona, and when combined with their amazing bar foods, it makes for a great pregame bar. Coco Vail has a great atmosphere with good rock music and a wide open space where you can enjoy some of their famous chicken wings. With a fun atmosphere, good company, and a huge menu, hopefully the hardest decision you will have to make is what to order! As a new bar to Barcelona, D9 is a hidden gem for pre-games. It has two levels inside, an upper bar area with tables and games, and a lower level for sitting and casually drinking. 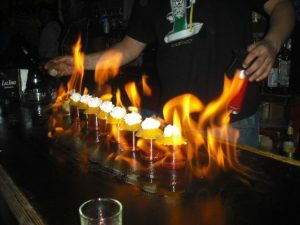 They have great drink specials, including one of the best deals in all the city: 6 shots for 5€. Other shots of “house” alcohol is 1,50€, mixed drinks are 6€, and beers range from 1,50€ to 6€. 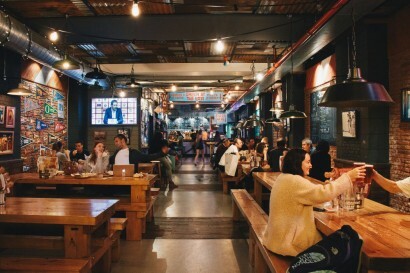 D9 is also a great place to go to watch sports games, both American and European, because of their sports bar atmosphere and giant projector screen. Dow Jones is a one of the most unique bars in Barcelona. The prices of drinks fluctuate based on the real stock market. They refer to themselves as the “only place where a crash is a good thing”, because when the market prices drop, it’s a fight to get to the bar before it goes back up. There is a live feed of the prices on their website if you are interested in checking the prices before you go. In that sense, certain nights are better to go than others, but it is hard to predict – just like the real stock market. The Barcelona bar scene is full of interesting and unique places to prepare for the night before heading to the clubs. 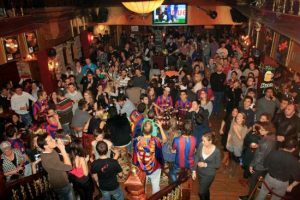 At CeleBreak, we put value on bonding with the community both on and off the football field, especially through Barcelona’s nightlife. If you are interested in joining our community of football players in Barcelona, sign up on our website with the CeleBreak app, or join our Facebook group for updates.